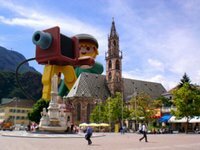 Alora, Happily is having its European premiere in the Italian city of Bolzano. The 40th annual Bolzano Short Film Festival is taking place November 12-15 and we are participating in the "Short Film Experiment" section. Bellissima! WOW, We're Going To Sydney!